Cupcakes are one of the favorite America's desserts. They come in many flavors, and chocolate cupcakes are a delightful treat enjoyed by chocaholics and dessert lovers. The National Chocolate Cupcake Day is celebrated on October 18 across the United States. Chocolate cupcakes are made with cocoa flavored batter (sometimes with chocolate chips stirred in). They may or may not be topped with chocolate flavored frosting. 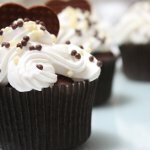 Chocolate cupcakes are sometimes filled with chocolate ganache or sprinkled with grated chocolate. To celebrate the National Chocolate Cupcake Day, pick a couple of delicious cupcakes at a local bakery or go out in a coffee shop. You can also bake cupcakes yourself and treat your family and friends. Here is an easy chocolate cupcake recipe for you. Mix 1 1/2 cup flour, 1 cup sugar, 1 cup water, 1/2 cup oil, 1/3 cup cocoa powder, 1 tbs vinegar, 1 tsp salt, 1 tsp baking soda, and 1 tsp vanilla extract until moist and well blended. Put batter into paper-lined cupcake tins. Bake at 350 &;deg;F for about 20 minutes. Let cool and frost with chocolate icing. To make the icing, mix 3 1/2 cups powdered sugar and 1 cup unsweetened cocoa powder in a bowl. In another bowl, mix 1/2 cup milk and 2 tsp vanilla extract until blended. In the third bowl, whip 12 tbs softened unsalted butter until fluffy and smooth. Gradually add cocoa sugar and vanilla milk to the butter and beat until fluffy and well blended.